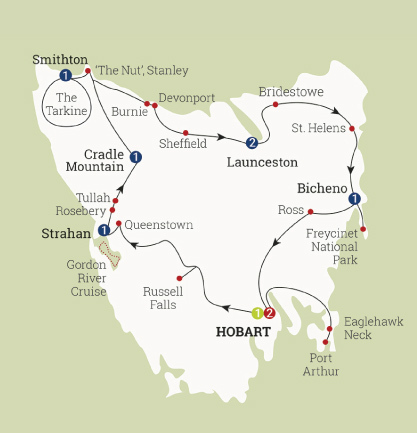 10 day/9 night Tasmanian Wonders tour including comfortable accommodation, travel by luxury coach, experienced travel director and driver guide, daily breakfast, 1 lunch, 5 dinners & airport transfers. Cruise on the Gordon River including a delicious lunch. Discover Cradle Mountain National Park on a guided tour. See ‘The Nut’ at Stanley. Enjoy a guided tour of the magnificent Tarkine Wilderness region. Indulge in local cheese at Ashgrove Tasmanian Farm. Visit Beaconsfield Mine and Heritage Centre. Discover Bridestowe Lavender Estate and the delicious lavender ice cream. Spectacular views from Cape Tourville Lookout. Step back in time at historic Port Arthur. Subject to availability, conditions apply.